KidAdmit is tackling part of the education market that has seen little to no progress in terms of workflow productivity and innovation, by starting with a focus on early childhood education, Tejal and team are building a well designed and useful tool for the admissions process, targeting both the early childhood educator and administrator, as well as the hyper engaged parent market. KidAdmit has an elegant solution to streamline a very labor and paper intensive process--applying to school. They have substantial traction with a number of schools and is already generating revenue. School Applications & Enrollment Made Easy! KidAdmit allows online submission of school application and enrollment forms. Schools can review applications, manage applicant waitlists, and quickly communicate with parents. Parents can search for schools by specific criteria and apply directly using KidAdmit. We are quickly advancing schools by connecting them to today’s tech savvy parent. We are starting with early education with the clear vision to go forward into K-12 and beyond. CEO/Founder @KidAdmit, Previously Principal @Peninsula Wealth, multiple roles in business development and sales cycle management. Core team member of Rock Your Voice First Place Winner of Oakland Start Up Weekend Education 2014, Crowd Favorite Award and Clever Innovation Prize. 6.6 Million children are enrolled in preschool, and there are 700,000 childcare centers in the US. Each family spends, on average, more than $300 in application/registration fees. This creates a preschool application and enrollment market over $2 Billion. The current method of admissions and enrollment are paper forms and there is very little technology to help streamline this process. KidAdmit can corner the market by doing something very simple by bringing this process online and then use that to build upon a much larger play targeting parents with young kids. KidAdmit is uniquely positioned to connect parents to both schools and activities. There are many sites out there that cater to people getting married (WeddingChannel, The Knot), couples (Nest), expecting parents (Bump), and those with newborns (BabyCenter). What happens next for parents of young children? This is where KidAdmit comes in. We provide a free application solution for preschools and day care facilities. * Application fees - Parents pay $10 for every application they submit. This convenience fee is rolled into the application fee that schools charge. Parents can apply and pay online via credit card, instead of submitting a paper form and a cheque. 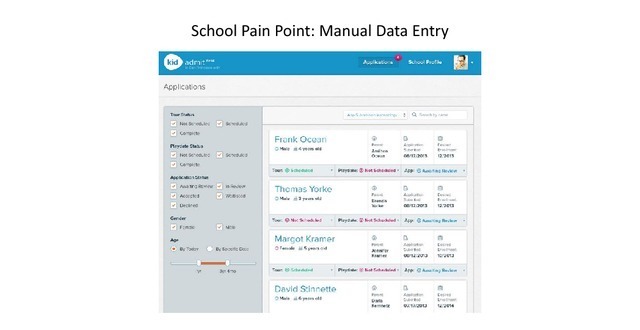 Schools get their entire application process digitized and streamlined. *Preminum features for parents - Concierge service, expert matching to style of school, etc. *Premium features for schools - The KidAdmit application portal is free for schools to use. In the future, KidAdmit will also offer premium features such as enrollment forms, online tuition payments, targeted events, and activities. Schools will have to pay to upgrade to these services. * Other verticals - KidAdmit plans to offer solutions for middle schools, high schools, afterschool facilities, kindergarten, and activity programs. Most competitive solutions fall into one of two categories: either a search and discovery engine (like Savvy Source and GreatSchools) or a software provider geared for K-12 education (like Inresonance and Infosnap). KidAdmit is the first actionable solution to connect parents and preschools using an online platform. KidAdmit captures the entire preschool application process from beginning to end, starting with the ability to search and compare all the way through to application and admission. It's more than just looking through a school's information. KidAdmit facilitates the most important step - applying to and keeping up with a parent's top schools. Preschools benefit from KidAdmit by being able to review applications, manage their waitlists, and quickly communicate with parents. Schools add the "Apply with KidAdmit" button directly to their website, making it easy to receive all submissions through KidAdmit. Soon, KidAdmit will be the defacto portal for admission and enrollment process everyone. No competitor manages the admissions process as comprehensively for both schools and parents as KidAdmit. KidAdmit offers a neutral environment for parents to narrow preschool choices based on the criteria that are most important to them. Building on a commitment to finding the highest quality preschool that fits each individual family, KidAdmit provides a non-biased platform that lists all of the early education options. By not giving preferences to any preschools, we allow our filter criteria to help match families with the right school. There are many great preschools out there, but the BEST one is the one that matches the needs of that family. Preschools have used paper for their admissions and enrollment processes for as long as they can remember. With today's technology, pushing paper is not only inefficient, but also takes time away from the people that matter - the families and children that would like to be a part of that preschool. KidAdmit provides the tools that allow preschools to spend less time doing administrative work and more time getting to know the families. We take away the headache factor of paper applications so that preschools can focus on the human factor. Q: What's your traction like? How many schools signed up to receive KidAdmit applications? A: In the first 6 months since launch we have partnered with 25% of the preschools in San Francisco and have 20% of the San Francisco families using KidAdmit. By using influential members of the preschool community, we have gained brand recognition and reputation amongst the preschool directors. Q: Why is KidAdmit better than the alternative? 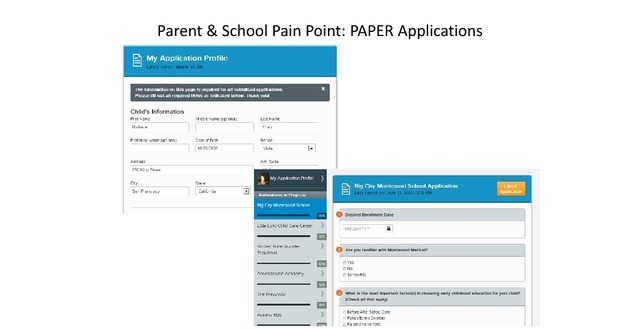 A: Currently, schools are using paper applications. KidAdmit eliminates the data entry and information management piece for them. KidAdmit provides tools to streamline the administrative work so preschool directors can focus on who really matters - the children. Our current users report saving 75% of their time compared to the alternative. Q: Is this an urban issue? Does it exist elsewhere? A: KidAdmit is an application process that can streamline ANY school's admission's process. 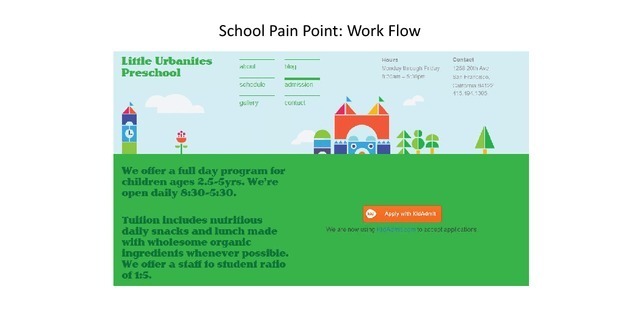 While there is a more competition in urban environments, every school has an enrollment process, and there’s a lot of paperwork. When we put simple strategies in place that help keep them organized, like KidAdmit, we free up the time that schools need to focus back on the classroom. Q: What are some reservations that the schools have? A: Some schools worry that they are outsourcing the admissions process. In reality, KidAdmit provides the tools for preschools to handle the process more efficiently. Directors still build the same connections and relationships but have an easier way to manage the paper work. We allow directors to focus on the educating and less on the adminstrating. 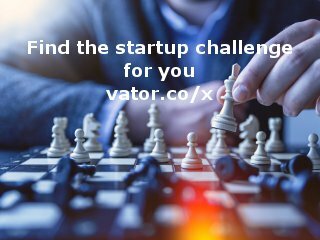 Tumml's mission is to empower entrepreneurs to solve urban problems. With a hands-on approach, Tumml provides entrepreneurs with the tools to help scale their impact and enhance quality of life in cities everywhere. KidAdmit, Inc. was featured in a VatorNews article: "Presenting all 15 finalists for Vator Splash Oakland!" KidAdmit, Inc. was featured in a VatorNews article: "The winner of Splash Oakland is... OppSites!" KidAdmit, Inc. was featured in a VatorNews article: "Today's Entrepreneur: Tejal Shah"
David Lee confirmed KidAdmit, Inc. as an investment.